Apparently, some kind of weather catastrophe is on its way to the NE. I was vaguely aware that we would be getting a winter storm of some kind. Several inches of snow, a foot perhaps. But now I'm scared into a frenzy. Good! That means the system works! I want to go home and hide under the covers because my phone just sounded an alarm like a World War II air raid siren, notifying me that MAJORBLIZARDRUNHIDEHIDEHIDE!!@#$%. A big round of applause to NOAA, FEMA, FCC, CTIA, and every other organization behind the Wireless Emergency Alert system because it works. Launched last year, the service automatically sends alerts to people within certain geographic locations about imminent threats to human life—ahem, the blizzard—as well as Amber alerts, and other emergency info. You've got to opt-out of the alerts on your phone if you don't want to receive them. Don't worry, they don't cost you anything. 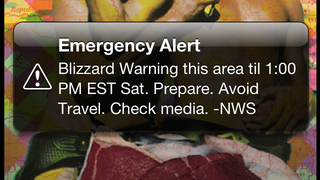 And after disasters like Superstorm Sandy, we're glad we're getting these alerts and that they're working. And BOY are they working. Everyone in the office just got notifications and jumped out of their seats.